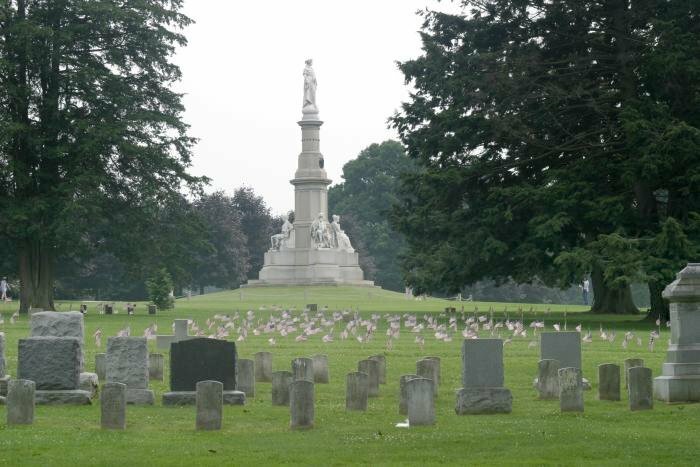 History is prevalent through the Gettysburg area due to its role during the Civil War. Most of that history has been preserved, so that everyone can take a step back in time and see what the town was like as the war was taking place. I spent a couple of days in Gettysburg with my family, so we could explore many of the sights and learn more about what happened during the Civil War. The first place we stopped was the Gettysburg National Military Park Museum and Visitor Center. Inside the museum section of the building, we saw many relics from the Civil War, and it is said that this is one of the largest collections in the world. I believe it, as the exhibit space was massive, and we could have spent hours carefully looking at each individual piece. While the exhibits were amazing, my breath was taken away when I went up the stairs to where the cyclorama painting is located. This painting is of Pickett’s Charge, which occurred on the third day of the battle in Gettysburg. The painting was completed by Paul Philippoteaux, who was a French artist, and it is forty-two feet high and three hundred and seventy-seven feet around. As my family was upstairs marveling at the details in this painting, the entire canvas came to life as lighting was used in addition to the sound effects. I felt like we were in the middle of the war for just a moment or two and you could feel the tension that must have been felt all those years ago. Before leaving the Visitor’s Center, we grabbed a map of the park, as it was our next stop. We also purchased a copy of the CD tour for automobiles in the gift shop, and I highly recommend it as it brought our entire experience to life! We started on our journey of the six-thousand-acre battlefield in our vehicle, due to the fact that we knew that the walk would take too long. After all, there are one thousand four hundred monuments, markers, and tablets throughout Gettysburg and we didn’t want to miss too many! As we toured the battlefield, we found a few favorite spots that included Little Round Top, Devil’s Den, and McPherson Ridge. During our drive, we stopped for what seemed like hundreds of times, simply because of the number of sights there is to see. There were plenty of other people along the route as we were there, but it never seemed crowded like I thought that it would. We couldn’t leave Gettysburg without stopping at the Gettysburg National Cemetery, where more than three thousand Union soldiers from the Civil War have been laid to rest. As soon as we entered the cemetery, we saw the spot where Abraham Lincoln delivered his infamous Gettysburg Address back on November 19, 1863. Gettysburg National Cemetery. Photo via wikipedia by Henry Hartly. As we were walking around the cemetery, we saw numerous monuments dedicated to those who lost their lives during the war. However, we also noticed that soldiers from other wars have also been buried within this cemetery. Right next to the soldier’s cemetery, there is a private cemetery, and that is where the one civilian who was killed during the battle is buried. Jennie Wade was in her kitchen baking bread when a stray bullet entered her home and killed her. We could see her grave from where we were due to the American Flag flying high next to it. This hotel was constructed back in 1804, but numerous restorations have kept it carefully preserved since that time. The James Getty Hotel can be found within the historic district and guests can walk to numerous historic sites during their stay. There are twelve suites available for guests and each one consists of a bedroom, bathroom, sitting room, and kitchenette. Continental breakfast is served every morning and cookies and chocolate are left when the beds are turned down in the evening. This farmhouse was constructed back in 1858 by Jacob and Tillie Weikert and they lived in it during the Battle of Gettysburg with their four children. The entire farm played a prominent role during the battle, but now it serves as a place for people to stay when they are in the area. There are five bedrooms in the farmhouse as well as a living room, dining room, kitchen, and laundry room. Reverend Alexander Dobbin built the house that is now this restaurant back in 1776, many years before the beginning of the Civil War. Dobbin House Tavern is a restaurant where guests can dine on extraordinary cuisine by candlelight. This restaurant offers an elaborate and authentic Civil War period dining experience to their guests. Servers are dressed in Civil War attire and there are more than one hundred noticeable bullet holes on the exterior southern wall. The tavern is family friendly and during the warmer months, many guests prefer to dine out in the garden near the flowers and flowing waterfalls. I am planning another trip to Gettysburg soon, because I know that we missed quite a bit during our first trip there. I will be visiting the Gettysburg tourism site to find all the information I will need for my trip and you can do the same!